Do you have bare, unadorned, walls? Do you wish to put something in it? 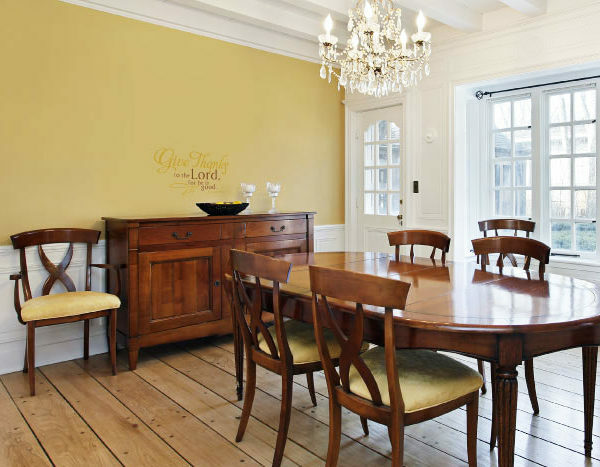 Are you tired of the common wall fillers like paintings and posters? Do you wish to have something different to put on them? Do you wish to be motivated by that wall? You are in the right place if you answered “yes” to at least one of these questions! DecorativeLettering offers a solution for your need. We have a jam-packed bag of ideas that can be adorned into that bare wall you have. We have creative ideas that can motivate you. And these are not paintings, these are not posters; these are wall tattoos which are not at all common! 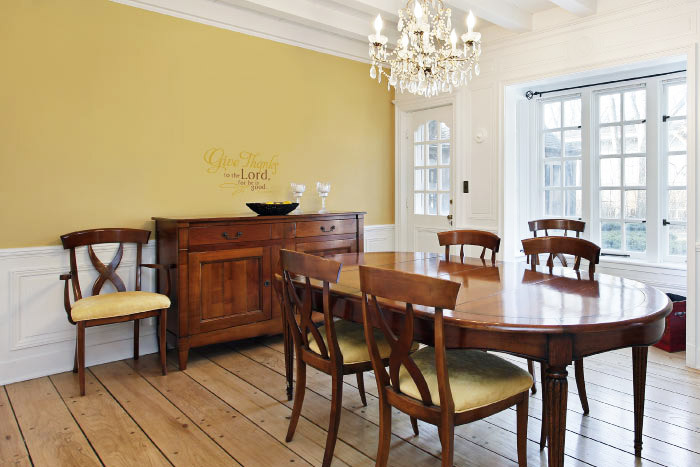 Observe this dining room that we chose to put a decal on, and imagine that you are a painter. A painter always starts with an empty canvas. He chooses the colors usually based on his current emotions and situation. And then adds a spark of touch; the texture, for an extra feel on the skin. He lays all his emotions on the canvas; the reason why we can identify with him; happy or sad, hopeful or lifeless, motivated or motivated beyond the typical. That’s what a single masterpiece consists of; creating life from a once-lifeless canvass. And from the end result, we can see the contents of his heart. We perceive our customers as artists who want their hearts to be seen by what they adorn their homes of. Yes, we have pre-designed scriptures, but we want you to pick your own font style, color, size and even all the embellishments you want to add! Designing your own decal is not hard at all. Try it! We have tons of quotes and scriptures to choose from and be creative with.